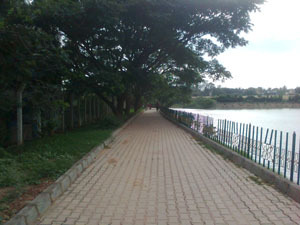 There is a walking and jogging trail of 1.6 km around the lake for the benefit of people of all ages. The plants and trees around the lake provide a lot of clean air to the users of the lake. There is a children's play area beside the lake. A senior citizen's park is planned for the next phase. The lake and the park around it are maintained by the Chinnappanahalli Lake Development Trust (R) which is a purely voluntary organization. We are grateful to the sponsors, individual donors and volunteers who have generously contributed their money and time towards the development and maintenance activities around the lake. We welcome all of you to come and enjoy the beauty and serenity of the lake. Donations are greatly appreciated and are tax-exempt in India.